Address: Department of Architecture, State University of New York at Buffalo, Buffalo, NY, 14214, U.S.A.
Fields of interest: Architectural design, basic design (including symmetry, theory of structure, topology, Gestalt principles, color perception, functional application of color). Publications: (2000) Ordering Disorder after K. L. Wolf, in: Forma, vol. 15, Tokyo: KTK Scientific Publishers, 41-47; (1996) The Programmed Design: Toward Hidden Symmetries, in: [Abstract] Mathematics and Art: Second International Conference "Nonlinear World," Moscow: Moscow State University, 67; (1996) The Landscape Handscroll and the Parquet Deformation, in: Katachi U Symmetry, Tokyo: Springer-Verlag, 307-314; (1995) The Programmed Design: Probing the Discernibility of Properties of Symmetry, in: [Abstract] Symmetry: Culture and Science, vol. 6, Budapest: ISIS-Symmetry, 254-257; (1975) 2, (1977) 3, (1967) 4, (1971) 5, (1970) 6, Symmetry: an appreciation of its presence in man’s consciousness. Pittsburgh. Abstract: The trisectioning of the cube into congruent parts is one of several three-dimensional assignment of my formative design studio that has been intermittently investigated with my students for nearly 30 years. It grew out of a wider pedagogic challenge: the sectioning of the cube into any number of congruent parts and, even, the sectioning of other regular and semi-regular solids in such wise. 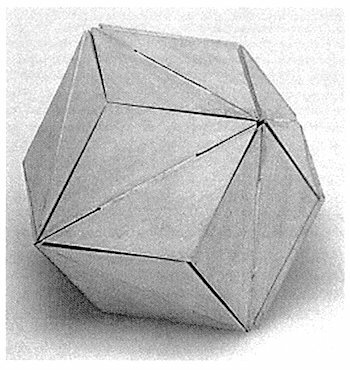 A remarkable design from the unpredictable pool of student creativity (in this case, from John Lape) came out of the early phase of this studio task: a rhombic dodecahedron, sectioned into 24 congruent, non-regular, superposable tetrahedra. The art of this artifice—which, arranged into 12 square-based, split pyramids, can lie flat on a plane (Fig. 1)—is derived from the fashion in which the 24 parts are hinged together; for it is most remarkable that there are two strikingly different ways to assemble this hinged wizardry into a rhombic dodecahedral body. One may be called the wrapped cube; the other, the radiant pentahedra. A telling sign of this dualism lies in the recognition that, in one assemblage, a joint cuts across the short diagonal of each rhombic face and, in the other, a joint cuts across the long diagonal of the rhombic face. 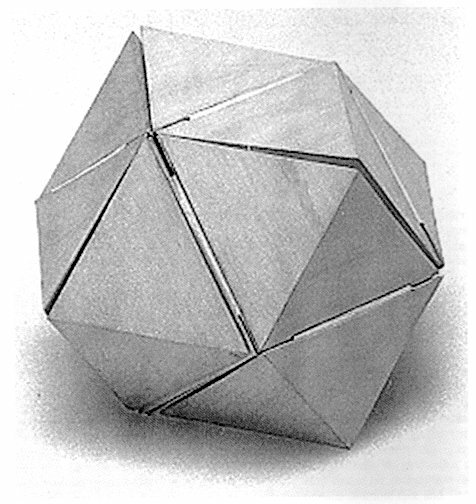 Before attempting the more difficult feat that is met in the assemblage of the radiant pentahedra (Fig. 3), it does well to return the hinged configuration to the planar layout. By pivoting two elemental units on the hinge that pairs them into a square-based, split pyramid, a rhombic-based, split pyramid is formed; and as one after another of these are in the like manner paired, the whole configuration automatically begins to pull together (the apices of all 12 pyramids meeting at the body’s center) into the alternatively assembled rhombic dodecahedron, which displays hinged joints running across the long diagonals of the rhombic faces. It is seen in the planar layout that four of the pyramids are connected at their basal edges to three other pyramids, two are connected to two, and six are connected to one. The six singly connected, square-based pyramids, being re-paired into rhombic-based pyramids, will flip-flop into alternate positions, as this version of the assembled dodecahedron is taking shape; and an incorrect positioning of any one of them will throw the assemblage out of kilter.